I spent the last month and a half using a Mac and OSx, running both OSx and Windows and while doing that one thing I really appreciated was the use of multiple desktops that OSx supports. It's been especially useful when running parallels which you can set up in such a way that it runs the Windows instance on a separate desktop which is convenient. I've since switched back to Windows and I have to plead ignorance: I didn't know that Windows has had support for multiple desktops for some time. Multiple desktop support actually harks back all the way to Windows XP, but the operating system didn't officially expose this functionality. However there are a number of utilities out there that you can use to take advantage of multiple desktops – in a limited fashion today. Even better though is that Windows 10 will native support for multiple desktops. Windows 10 officially adds multiple desktops as a feature as part of a host of new desktop manager features that can be managed through the Windows UI as well as with convenient hotkeys. Hopefully they'll also add support for touch or mouse pad gestures so that you can swipe to new desktops as you can on OSx, but currently I don't see support for that (touch pad vendors would have to provide the gesture mapping support I suppose – then again given how crappy most Windows machine touch pads are maybe that's not such a good idea – my Dell XPS touch is the worst piece of crap I've ever used, amazing that manufacturers can't get such a simple device right). Windows-Tab: Bring up the Task View which includes a new Add Desktop option this view also shows you all of your open desktops on the bottom. Windows-Ctrl-Left/Right Arrow: Switch between desktops. You can use these key combos, or you can use Windows-Tab and then select the desktop of choice interactively as shown in the screenshot above. Moving Windows between desktops: You can also move windows between desktops by simply dragging them from the task view on the active desktop onto another desktop on the bottom of the task list. This is my main desktop where I do most of my work and get stuff done – mostly development work, business stuff, writing, browsing for research etc. Supplementary Desktop: Media, Email, Twitter, Social Browsing etc. During development I prefer to have all my Web related stuff running on a separate desktop. Typically this means running Chrome with a separate DevTools Window each taking up their own screen in a multi-monitor setup, which makes it very easy to see things happening. By having only the things I need running in this setup it's much easier to see what's going on. Other things I run in this desktop is any test agents and other tools I use to access requests like WebSurge for URL testing of APIs etc. The nice thing is that development and the running application are separated only by the switch desktop key and I can get a much cleaner clutter free view to play with this. It does take some getting used to pressing Windows-Ctrl-RightArrow instead of Alt-Tabbing to the browser and the dev tools, but that'll happen with time. In typical Systernals tradition, it's a small self-contained utility that provides the core features you need. 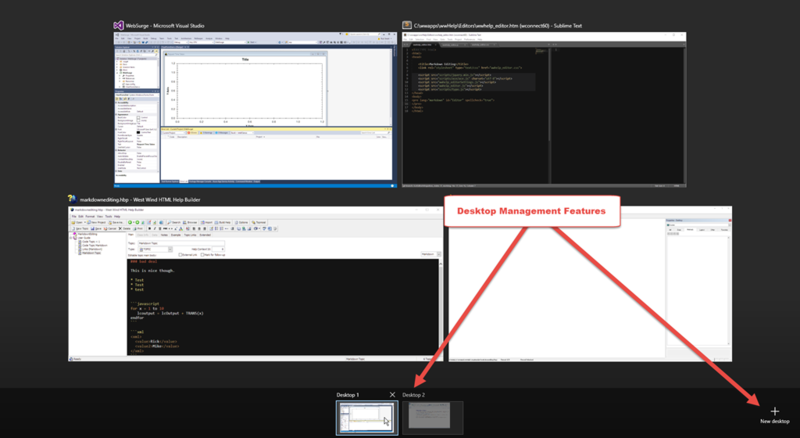 Desktops is a small tray icon application that allows you manage up to 4 desktops. You can then switch desktops by using the pop up view above, or by using a set of hotkeys you can configure as part of the options. Desktops is pretty bare bones. It doesn't have support for closing desktops and you can't move things around, but its simplicity and small size make it a good choice for desktop management. There are a host of other tools that let you create virtual desktops but most don't actually use this 'hidden' windows feature but rather create their own separate desktops to display and manage. The nice thing about this simple, but basic utility is that it's small and lightweight and works with what's in the Windows box. I've only used the new desktop features in Windows 10 for a few days now but I've already found them to be pretty damn useful to keep clutter and distractions to a minimum, especially when coding. So if this is new to you in Windows, it might be worth checking it out. I'm glad to see that this feature has become an officially supported feature in Windows 10. Love the newer builds of win10 on my laptop, but I do miss the 3 finger swipe left and right from OSX for multiple-desktop navigation. Been looking all over for something that would enable that. @Dan - the gestures would have to come from mouse drivers. I think the Syntaptics drivers have a bunch of mouse gestures you can define but it will take Windows 10 specific drivers that can recognize multiple desktops. Not holding my breath though, since PC touchpads are so freaking crappy compared to the MacBook's touch pad. Clearly touchpads on pc's are treated like an afterthought. I bought an apple trackpad and a bluetooth dongle from BestBuy to operate my 4K PC home theater. After installing the software I'm able to 4 finger swipe back and forth between desktops like on my MAC. I was on the verge of selling my x51R2 to buy a MAC, now I'm perfectly satisfied with Windows.